Great Items For Everyone! Gold, Coins, Firearms, and MORE! SOLD AND CLOSED Rita's Italian Ice! Rita's Italian Ice Store! Bidding to Start NOW!!!! At Your Bidding and Auction 757 Present the Suffolk Rita's Italian Ice Restaurant. 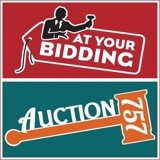 At Your Bidding and Auction 757 Present the Chesapeake Rita's Italian Ice Restaurant. SOLD AND CLOSED AWESOME AUCTION!! We are accepting consignment items relative for this auction. Give us a call with your consignment ideas!